Chateau / Country House2100 sq. ft. 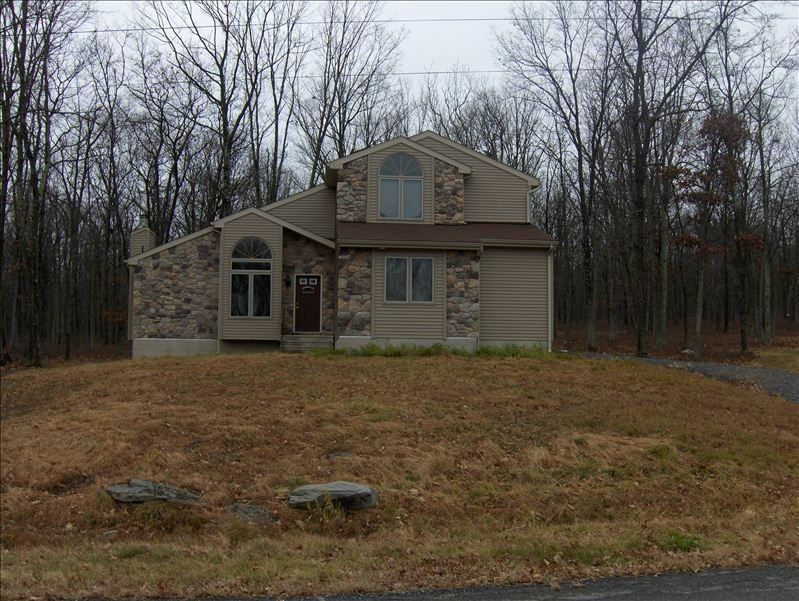 Rent this beautiful, recently constructed (2007) country home located on a wooded lot in a private development where you can enjoy the area’s wildlife and all the beauty that nature can provide. Whether you are planning on relaxing, finding adventure or a romantic getaway vacation, you can make this your special place. The living room is nicely appointed with plenty of comfortable seating and wall-to-wall carpeting where you all can plan your day. During the day, feel free to relax in the sun-drenched living room area with its over-sized arched-windows. If you’re staying in for the day you can read your book, surf the internet (free high speed wireless included!) or enjoy cable TV. You can even get closer to nature in our screened-in porch where you can relax and read or simply be at one with nature and watch the wildlife in the wooded back yard. Are you hungry? Our kitchen provides everything you will need to make a cozy dinner or gourmet meal. The full kitchen is also equipped with a microwave, toaster, coffee maker and most any of the cooking tools you’ll need. How about a barbeque? Cook your favorite barbeque meals on the stainless steel Weber grill located in the screened in porch area! At nighttime after your fun filled day, sit in the living room and enjoy the stars outside through the skylights windows while you enjoy the gentle crackles of wood burning in the beautiful, stone-front fireplace; firewood included. When it’s time to retire for the night, the highlight of our four bedrooms is the gorgeous and spacious master bedroom suite with its king size bed and private bath. In addition to the master suite, there are three other bedrooms: a queen-sized suite, a bunk bed and futon bed. Feel like having a soak? Enjoy the hot tub in the master suite. And when it’s time to clean up, feel free to use our full-size washer and dryer. Saw Creek Estates is in a perfect location as it sits minutes away from Ski Shawnee and Camelback Resorts. Saw Creek Estates has amazing amenities such as indoor and outdoor pools, tennis courts, basketball courts and a baseball field. Saw Creek Estates also has its own ski resort with skiing and snow tubing. Nearby to Fernwood Resort and other major Pocono area resorts that offer horseback riding, golf, snow tubing (winter), bumper boats (summer), comedy shows, gambling, rafting and canoe trips. There’s always something for everyone! We rent by the midweek, weekend or by the week. We’re certain that once you rent from us, you will be a return guest. We look forward to exceeding your vacation expectations. Your hosts are Erin and Gregg Rappaport and we are eager to make your stay the best it can possibly be. We had a great time staying in this home as the owners were very nice and accommodating. It is a very large home and if you have family or friends staying at the same time everyone has their own space. The amenities are great as there are indoor and out door pools, gym and to be able to row around the pond is great as they are included in the stay. There is plenty to do that is close by and a small drive will get you to most anything you want to do. There are some good restaurants and the Bushkill Falls are a must see. Will return. The house was lovely and in a terrific area located near Bushkill falls. It did not appear to have been cleaned prior to our visit, especially outside. The grill and patio was full of pollen. We cleaned it ourselves and the igniter on the grill still didn't work. The home didn't have a coffee maker. My parents bought a cheap one and left it for future guests. The house was not as clean as my expectations from previous vrbo stays. But it was a nice family friendly home. Overall, the place was good enough but not up to our expectations for VRBO or Airbnb standards for cleanliness. A newer section of this community. Modern house with large living/dining room combo. Breakfast nook, enclosed porch, great master bedroom with jacuzzi tub. Well equipped kitchen and toys for the kids. Our group thoroughly enjoyed the weekend. Beautiful home for a family getaway! We rented for the Thanksgiving week and had an extraordinary time. The home was the perfect "home away" for our family holiday. Plenty of room, great kitchen and common areas, beautiful fireplace, and great community amenities for everyone (we enjoyed the gym, indoor pool, and indoor tennis). Greg was a pleasure to work with and a wonderful host! This home is spacious, relaxing, beautiful & cozy. Gregg was great !!!! Kids loved just spreading out in their rooms. Everything we needed to decompress from busy lives. We stayed at Gregg and Erin’s home for our annual girl’s trip in August 2016. What a beautiful, warm and welcoming home in a nice quiet community. The large kitchen accommodated our group and the bedroom and bathroom configurations worked well for us. The screened in porch and deck with a gas grill were an added bonus. There’s plenty of room for parking in their long driveway. A great Tiki bar is a couple of miles down the road where you can sit outside and grab a couple of drinks and some good food. Although we’ve never met Gregg and Erin; they were great to rent from. You can tell they really love their home and they want their guests to enjoy it as much as they do! We will definitely be back in 2017. The Refundable Damage Deposit of $100 is meant to apply to the cleaning of the home. If the home is found in a condition other than as detailed in the house rules, a deduction of the part or all of the damage deposit may result. The house rules will be available for review during the rental agreement process.